O the weather outside is frightful today, but the important thing is, it was not so bad yesterday and so I was able to make it in to church with my King Cake. That is a picture of it up above! I put it on Facebook and people are so nice, I got something like 80 likes. My King Cake went viral! It was quite an experience making the cake. It is always fun to make something new, something which, you have never made anything like it before. 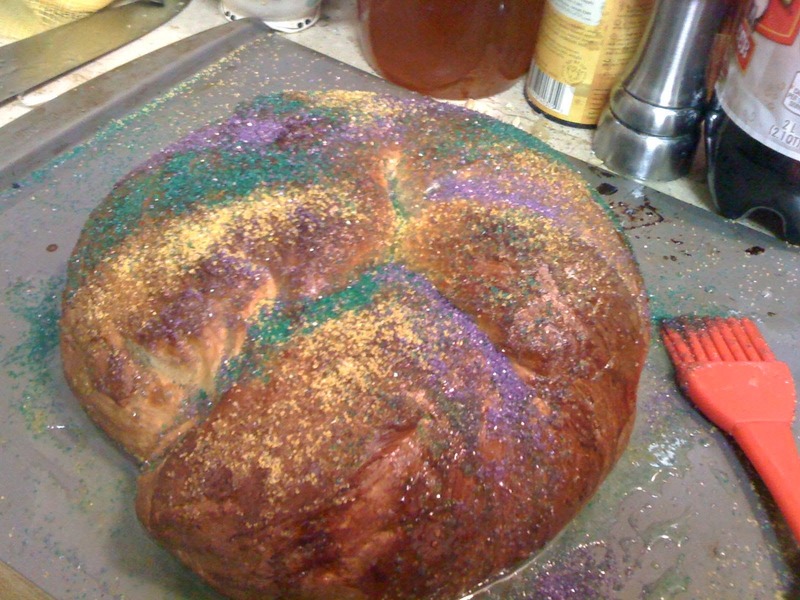 And the King Cake was like that, this great overblown sweet bread that inflated like a beach ball in the oven. No kidding, it went into the oven this kind of demure rope of dough, twisted into a circle. When it came out it was huge. My friend Bill at church said that it looked like a turban such one of the Kings would have worn. I was thinking the same thing. Especially when it was dusted with the sugar, it looked Eastern. Even the monsignor who said our Mass admired it. I am the Leonard Pennario of King Cake bakers! Anyway I was happy I could take the cake. I was worried about the weather because the winter has been such a roller coaster, and so I even checked on bus times so if I needed to, I could take the bus. Nothing was going to keep me from St. Anthony's yesterday, not when I had this cake. But I did make it, and I even picked up Dorothy, and we all ate cake and jambalaya and Epiphany Bread and star cookies and sang "We Three Kings" and "Adeste Fideles" with the monsignor joining in, and there was much rejoicing. Plus, remember the bean you hide in the cake, the one President John Adams broke the cake apart trying to find? Guess who found our bean? This year is going to bring me good luck! Office cleaning ... or archaeological dig?